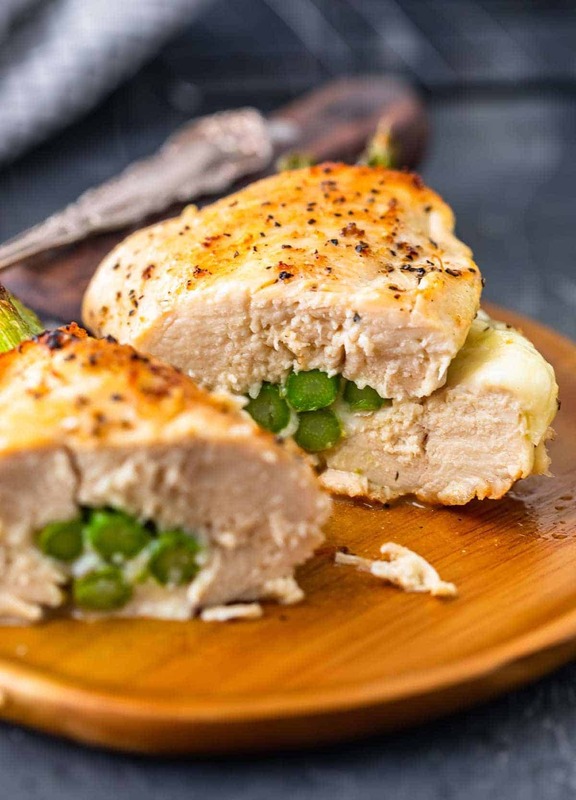 Cheesy Asparagus Stuffed Chicken Breast is the BEST Stuffed Chicken Recipe we have ever made! 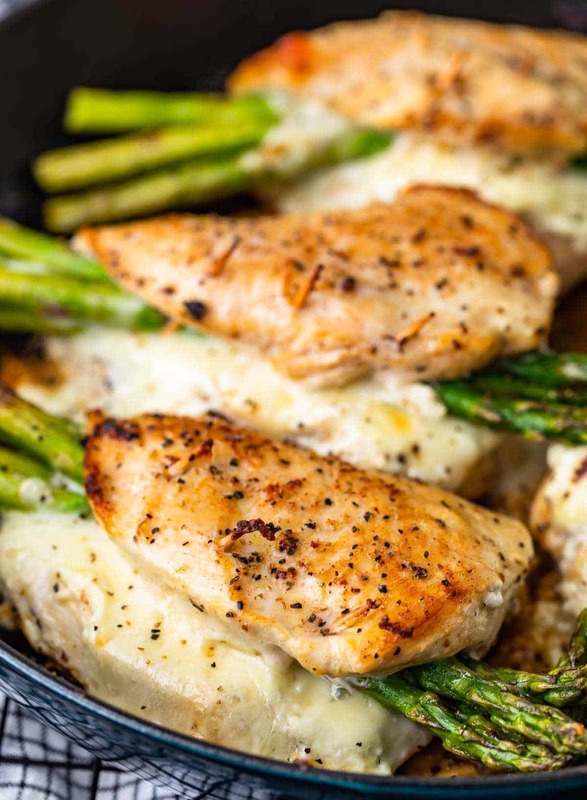 Tender chicken loaded with two types of cheese (goat cheese and mozzarella) and asparagus just can’t be beat. The flavor is out of this world! Chicken and Asparagus for the win. Who loves dinners that include minimal cleanup?? I know I do! 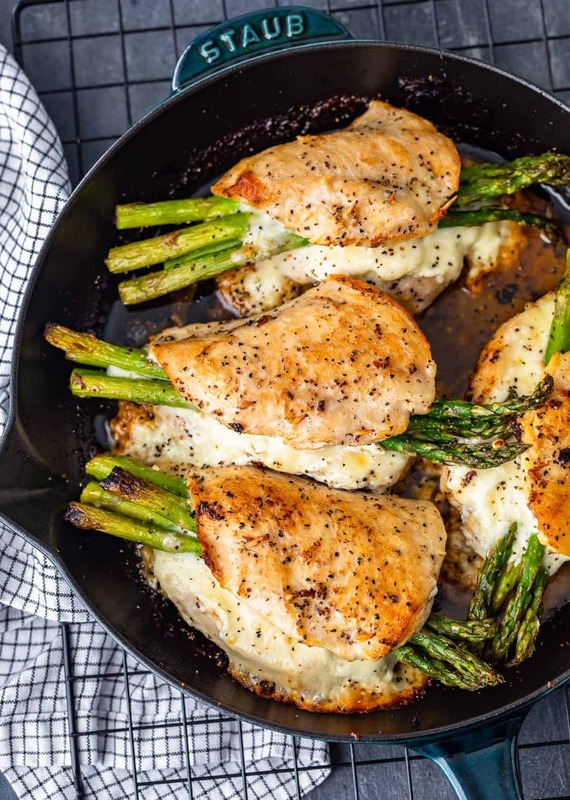 This cheesy asparagus stuffed chicken breast recipe weeknight dinner dream come true! 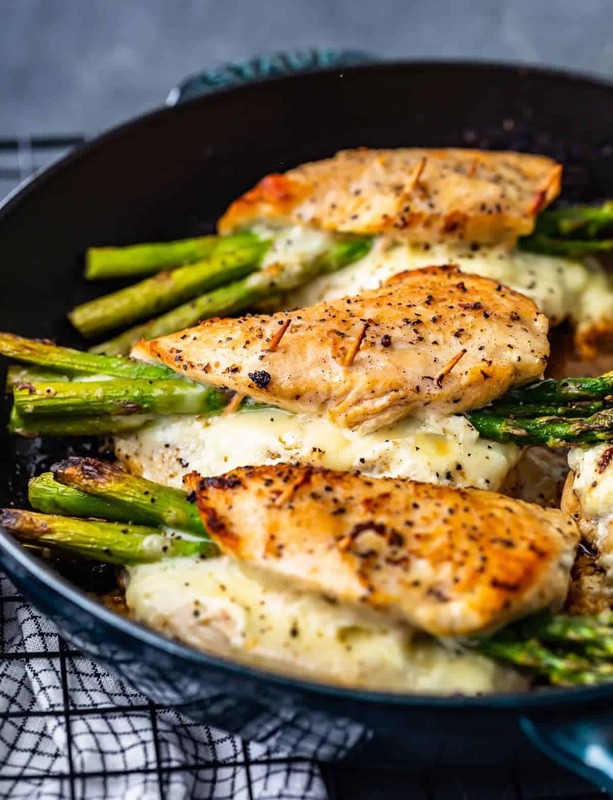 Its prepared with just a few ingredients, is filled with cream cheese and fresh asparagus, and only needs ONE pan! It really doesn’t get much better than that! 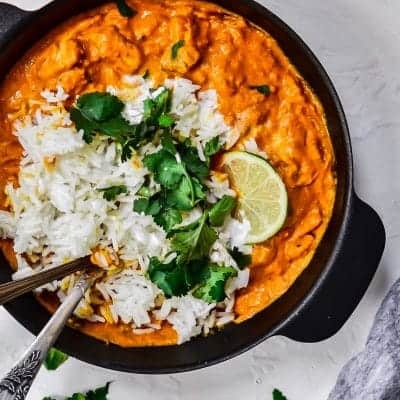 Oh, wait, yes it does, because you can also have this recipe done in under an hour, and its bursting with flavor the whole family will love. So, you pretty much have no reason not to make this recipe tonight! Stuffing chicken can seem like a task above the skill level of any beginners, but I assure you it’s easy as can be. For this recipe, you’ll just season both each chicken breast with salt and pepper to taste and then garlic powder and paprika. Then cut each chicken breast in half lengthwise. Be careful not to cut all the way through. You’re just making a place to put the cheese and asparagus. 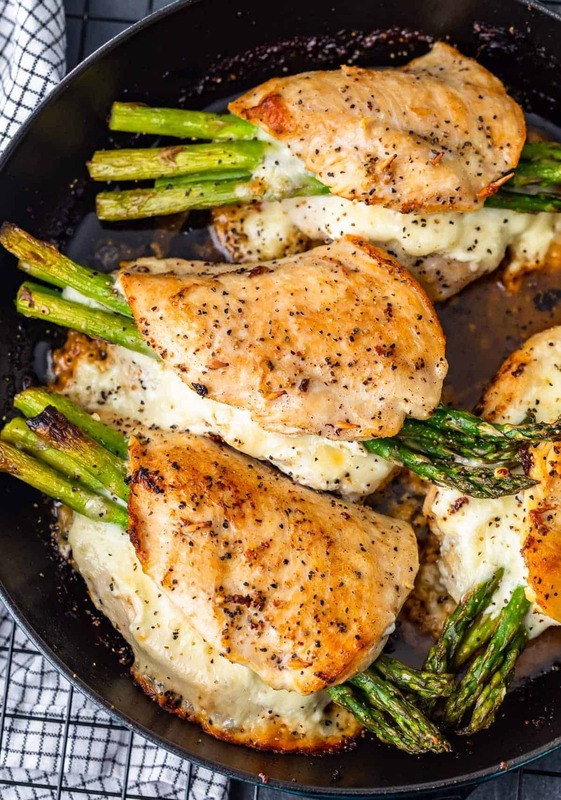 Spread the goat cheese into the inside of each chicken breast pocket and top with a few stalks of asparagus, then top with the mozzarella. lastly, secure each chicken breast closed with 3 toothpicks, taking care that they’re as flat as possible so that the chicken will sear fully. Thaw your chicken early: If you’re using frozen chicken, it’s best to let the chicken thaw overnight in the refrigerator. So, if you aren’t using fresh chicken, you will want to remember to take your chicken out before you go to bed the night before. I don’t suggest thawing chicken in the microwave because it will likely cook some of it, leaving you with dry rubbery chicken. Prep the asparagus: Don’t forget to trim your asparagus before you use them for the recipe. You will want to cut off the hard white ends at the bottom of each piece. 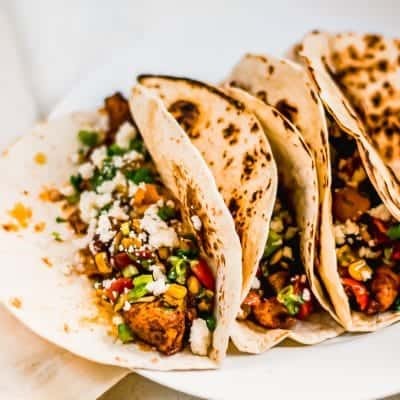 Make sure your skillet is oven safe: For this recipe, we will start on the stove, then move to the oven, so you’ll want to have an oven-safe skillet, like a cast iron skillet. Not all skillets are oven safe, so make sure you know yours is before you just plop it in the oven. 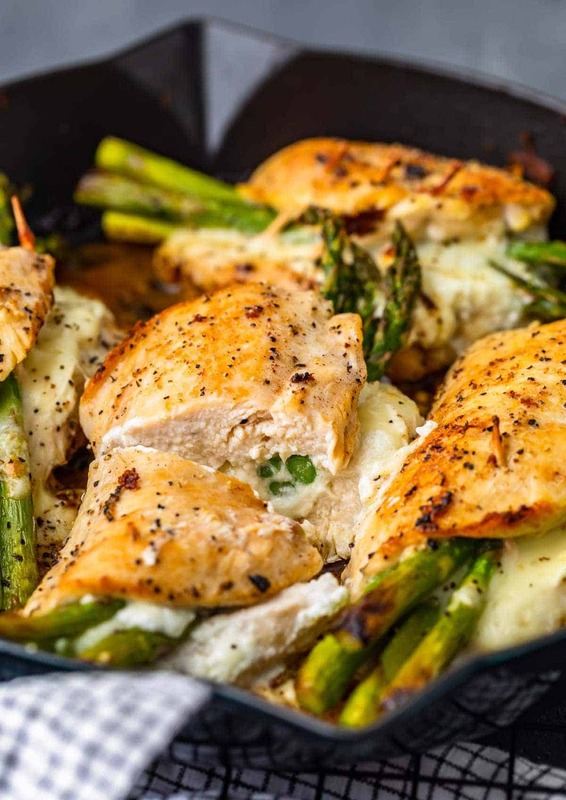 This elegant chicken and asparagus recipe is perfect for a weekend dinner party with your friends. It’s simple, only takes a few ingredients, and will have your guests thinking you’re a pro in the kitchen. Just pair it with a few other dinner party essentials and you’ll be the hostess with the mostess for sure. In my opinion, chicken makes the best leftovers. 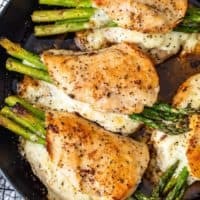 Whenever I make this asparagus stuffed chicken I love to make a little extra so I have a few leftovers to get creative with. One of my favorite ways to repurpose asparagus chicken leftovers is to chop it up and throw it into a salad. It’s a great way to add a little protein to my lunch without having to cook up something new. Another great go to is to chop up the chicken and make it into a wrap. Just grab your favorite tortilla, some lettuce, dressing, and any other toppings and you have an amazing lunch creation in minutes. When it comes to making dinner, I like by the words “if you can add cheese, do it”. Cheese just makes so many dishes better. 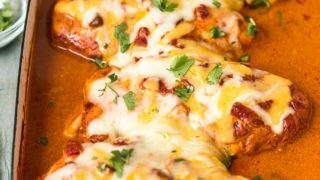 So if you’re like me and love a good cheesy recipe, be sure to check out the rest of my cheesy chicken recipes! 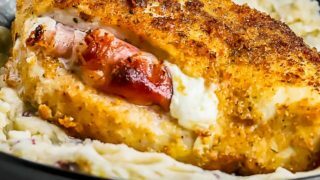 These other Cheesy Chicken Recipes can't be missed! Cheesy Chicken Prosciutto is a delicious and simple recipe perfect for those busy weeknights. This easy chicken recipe consists of pan seared chicken, prosciutto ham, provolone cheese, and fresh basil. Spinach Stuffed Chicken Breast is a 3 INGREDIENT CHICKEN RECIPE that’s healthy (around 400 calories per chicken breast), made in under 30 minutes, and done in just ONE PAN! 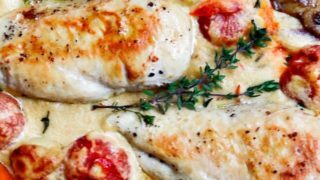 Healthy Chicken in Parmesan Cream Sauce is so delicious and creamy, you’ll never believe it doesn’t actually include any cream at all! Made with homemade Cashew Cream Sauce, you’ll never miss that heavy cream. 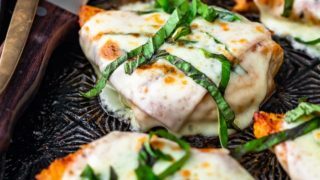 This Southwest Chicken Bake is an easy chicken recipe perfect for dinner any night of the week. With just a few ingredients and one dish, you can have the most delicious chicken dinner. 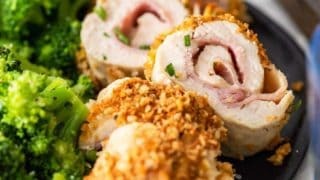 Prosciutto and Cheese Stuffed Chicken Breast is the perfect Easy Chicken Recipe for impressing guests! They sound fancy and gourmet, but if you can bake a chicken breast you’ve got this one in the bag. This recipe is the perfect mix of elegant and simple. 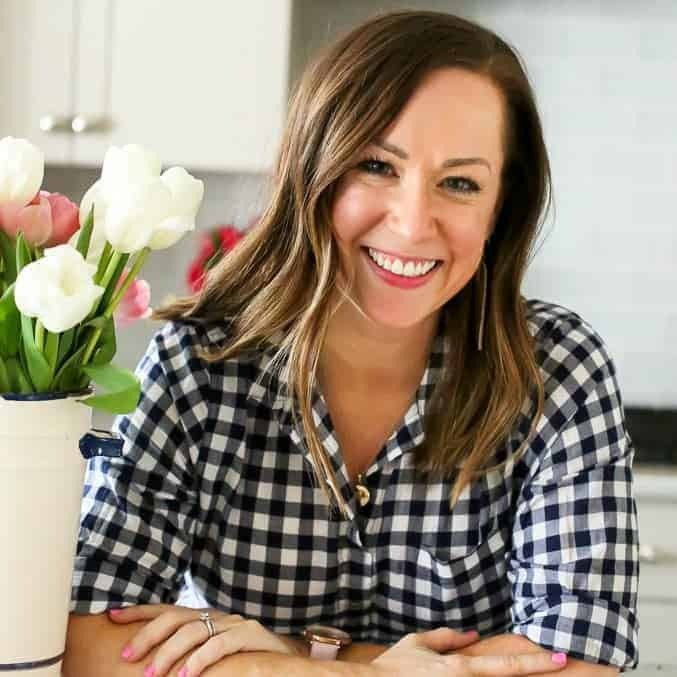 You’ll feel like you’re dining in a fancy restaurant as you dive in, without any of the hassles that typically come with a sophisticated dish. There’s no time like now to see for yourself how easy this recipe is, so print out that recipe card and get cooking! I can’t wait for you to try it. 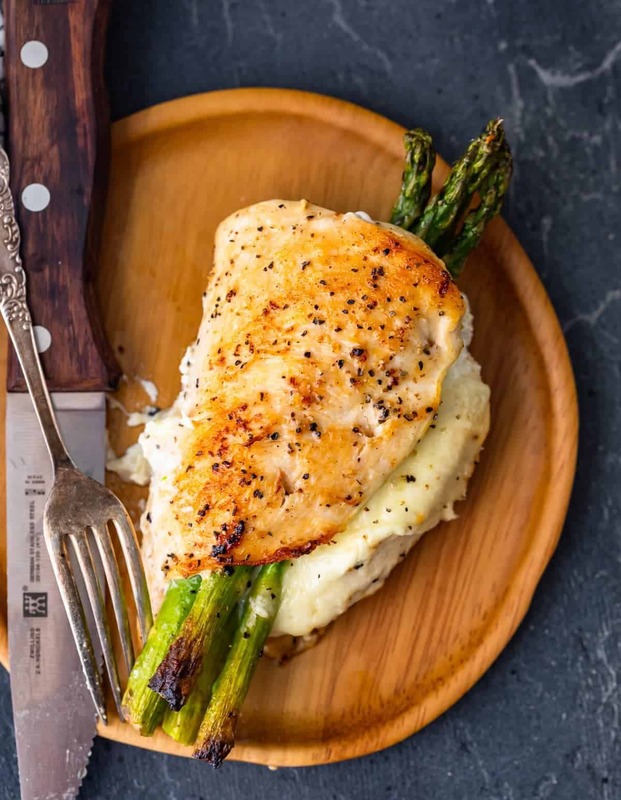 Cheesy Asparagus Stuffed Chicken Breast is the BEST Stuffed Chicken Recipe we have ever made! 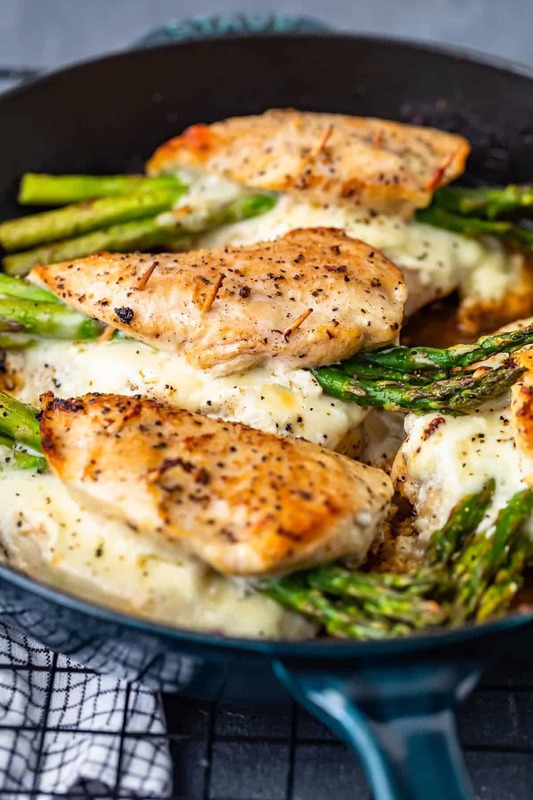 Tender chicken loaded with two types of cheese (goat cheese and mozzarella) and asparagus just can't be beat. The flavor is out of this world! Chicken and Asparagus for the win. Season both each chicken breast with salt and pepper to taste, and then garlic powder and paprika. Cut each chicken breast in half length wise. Be careful not to cut all the way through. You're just making a place to put the cheese and asparagus. 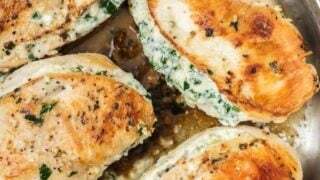 Spread 1 tablespoon goat cheese into the inside of each chicken breast pocket. Top with 4 stalks asparagus (sprinkle lightly with salt and pepper), and then top with the mozzarella. You might need to fold the mozzarella to make sure not too much is sticking out (it will stick to the pan if so). Secure each chicken breast closed with 3 toothpicks, taking care that they're as flat as possible so that the chicken will sear fully. Heat a large (oven safe) skillet over medium high heat. Add the olive oil and coat the pan. Watch for it to start to glisten. Once glistening, stir in the balsamic vinegar. Sear the chicken breasts 3-4 minutes per side, being careful to move them around in the oil so they don't burn, stick. Flip carefully. Place the skillet in the oven and bake for 15-20 minutes or until the internal temp on the chicken reaches 165F. 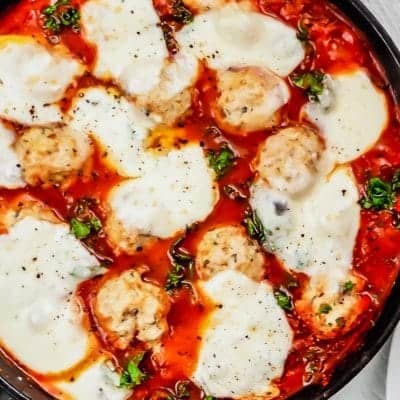 You have the best and easiest recipes EVER!!! Thank you for your assistance for someone who never knows what to make. I live alone and it would be nice to make recipes for 2. I am able to manage them into a smaller recipe. What a sweet compliment, So happy to have you following along. muah! Oh my gosh this was delicious! Thank you so much! Thanks for letting me know you loved it! I served this to six men. Yes, I said Six Fully Grown Men! They absolutely loved it! The only thing I did differently was to add salt and pepper to the asparagus. Thanks so much. I’ll be making this for years to come. That’s amazing to hear!! YAY! These were such a huge hit for weeknights at my house! Hooray! Love to hear that. This is making me hungry just by looking at your photos! What a great family dinner; I’ll try this out tomorrow, indeed! LOVE LOVE LOVE this dinner!!! The whole family gave it 5 stars! LOVED this chicken! So easy, elegant and delicious! The double dose of cheese was brilliant. My family loves this! It’s so easy to make, and a one-stop meal with veggies and protein. Asparagus lover here! That looks incredibly delicious. I can’t wait to try this! 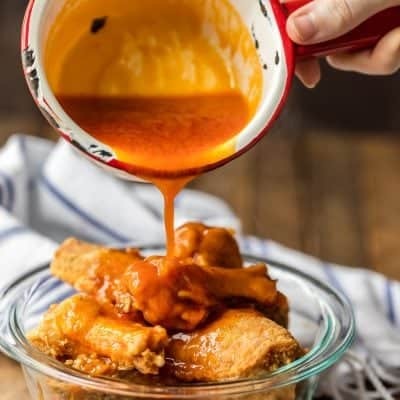 We love this recipe so much at our house! Everything you want in a meal! YUM!